There is much confusion on the web as to the correct identification of 'Rock's Variety' of L. primulinum 'Rock's Form'. Described in Woodcock and Stearn, p324, 1950 reads "An extremely small-flowered form, provisionally called 'Rock's Lily' (Fig. 100), introduced by J. F. Rock from Yunnan, flowered with Messrs. Constable in 1948. 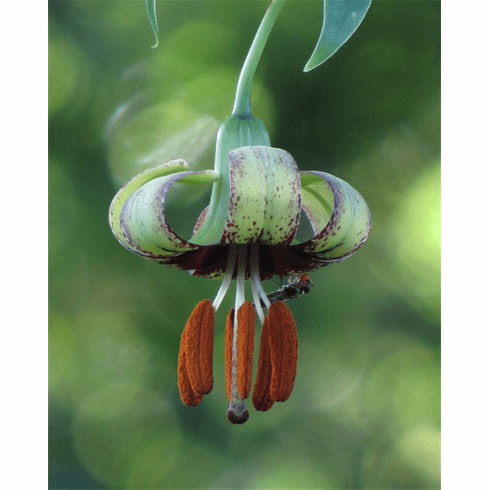 It had dingy flowers green outside with a purplish tinge, purple-black and yellowish inside, the orange-pollened anthers conspicuously protruding, and grows about 3.5 feet high: the segments were scarcely 2 in. (5cm.) long. This photo taken by Mr. Melvyn Herbert using a fly as a size comparison shows the extremely small size of this flower which he described as being only about 3cm in diameter. Title photo Photo copyright Melvyn Herbert, United Kingdom. All rights reserved. Used with permission.